[fist bump] for John Habel, Todd Steed, Paul Parris, and Chris Woodhull who put on Improvisations, a show that is local (to me) on radio station WUOT in Knoxville, TN. I can hear an hour and a half of badass jazz every weeknight on a technological horseshoe crab called “the radio” (or on the Internet, if you’re outside of tower-sight!). 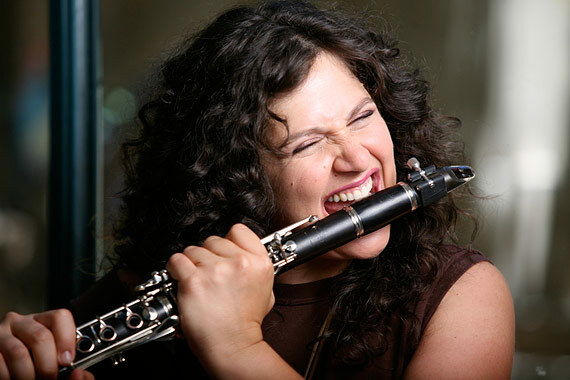 I heard recently for the first time, clarinetist and more, Anat Cohen, on Improvisations, and I now pass the reference on to you. This is a live recording from Cohen’s Clarinetwork Live At The Village Vanguard (2010), a cover of the old blues staple “St James Infirmary.” That’s a folk song voiced by a man standing over the dead body of his only love. Blues blues with a white sheet on top. If you dig what you hear, then it’s like we just connected some kind of meta-cognitive, cyber-synapse that makes us like hippie siblings reaching out to fist bump musical tastes across cyberspace. Making connections like Chuck Woolery.